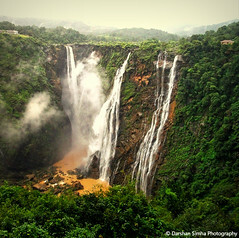 Jog falls is the eigth highest waterfall in India. Its height is 253m and width is 472m. Its formed by the Sharavati river when it splits in to four parts and jumps from the Deccan plateau to the plains. The four parts are called Raja, Rocket, Roarer and Rani. Associated with the falls is the Lingamakki dam and hydroelectric power station visioned by Sri M Vishveshwarayya. During summers the waterfall will reduce to small narrow streams while during monsoon and winters it will be roaring with water. August and September are the best months to visit. October to January is also fine. But during summer the water will be very less. There are only a handful number of hotels and lodges at the falls. During season its advisable to book in advance and come. Jog Falls is 380km from Bangalore. KSRTC runs one Rajahamsa till the waterfall. Alternatively one can reach Shimoga by direct KSRTC or Railway services from Bangalore. From Shimoga private and KSRTC buses are available till the falls. Except as otherwise noted, the content of this page except the photos and recent blog data are licensed under the Creative Commons Attribution 2.5 License. Stop littering and save environment.